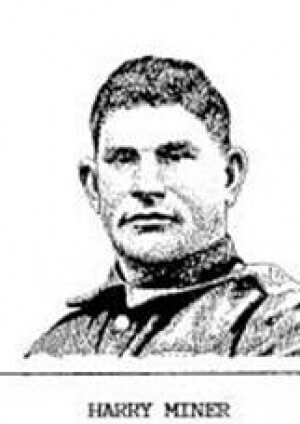 Corporal Harry Gamet Bedford Miner was born in Chatham, Ontario, 24 June 1891. He was posthumously awarded the Victoria Cross for his selfless acts of bravery and devotion to duty in the battle for Demuin, east of Amiens, 8 August 1918. The citation reads in part”…he rushed an enemy machine-gun post, single-handed, killed the entire crew, and turned the gun on the enemy. He then attacked another machine-gun post, putting it out of action and though mortally wounded finally rushed a bombing post, bayoneting two enemy and putting the rest to flight. Cpl Miner is buried at Crouy-sur-Somme, British Military Cemetery.